Special brazing rod containing specific addition of Manganese and Tin with free flowing characteristics. 870-890 C Melting Point. 460 N/mm2 UTS Strength. 130 BHN Hardness. A high duty, free flowing rod containing 9% Nickel which produces an exceptionally strong joint on cast iron, stainless and alloy steels. It has excellent wearing properties and is recommended for building worn components like gear teeth, bearings and valve seats since it work hardens. The high strength characteristics makes Sifbronze No 2 ideal for tubular structures, brazing cutting tips and as a general maintenance alloy. 920-980 C Melting Point, 540 N/mm2 UTS, 200 BHN Hardness. 309L Stainless Tig Rod 1.0mm. For use with Sifbronze No 1 or No 2. 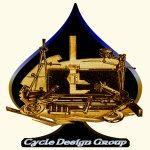 Cycle Design USA Fluxes & Silver Brazing Products. Sold by the troy ounce. With "Fillet Pro" you can join stainless steel to chrome-moly and vice versa. For fillet brazing at below 650C. Ideal for use with Martensitic SS ( 953)and XCR, SS tips and parts. Beyond any brass in finish strength at silver temps. Excellent for tips and fork crowns or loose fits. Sold by the troy ounce. 1.6mm or 2.4mm gauge. System 48 rod and flux together has the best capillary action and deepest filler penetration of all previous Silver Brazing formulas. System 48 Also will build connection fillets for seat stays, brake bridges, canti bosses, and is the only filler needed to build complete frame sets using lugs. System 48 Flow temp is same as older 56% silver fillers and flux washes off with water. Sold by the troy ounce. 1.6mm gauge. Available in 1.6, 2.4 or 3.2mm gauge. 1 lb (454 g) units. Creamy white, easy to apply, non bubble or flare, soaks off like silver flux in warm water. Please note special instructions for use. Also available as powder on special request. Safe general purpose silver brazing flux. Works for improved bonding and flow of high ratio, low temperature silver brazing rod. Optimal flow and clean joints regardless of silver grade percentage. Excellent for use with steel or stainless steel. Water soluble in warm water. Safe general purpose silver brazing flux. Works with and improves the flow of every high ratio low temperature silver brazing rod. Provides optimal cleaning, is great for non stainless tubes and provides a slower more controllable flow, regardless of the percentage of silver grade. For use with Nickel Silver Eg Sif bronze No.2. Can be used to braze stainless steel. However, in general we do not recommend the brazing of lightweight stainless steel tubes, particularly main tubes, due to the high brazing temperatures and the possible weakening of the stainless steel. Fillet Pro is the better option. These extra durable and easy to strike and set nails can be placed on adjoining lug socket (crisscrossed) and still be struck and set. Tapered Square Nails and two Correct # Number drills make Tight Pre-Pinning a cinch will grip even if the hole is uneven or enlarged. Used by Frame Makers for over a hundred years throughout the World.